Monochrome: you work with the colour of your choice to perfectly match your project! "Liorzh Kriz" is a cross-stitch chart with instructions translated in English. 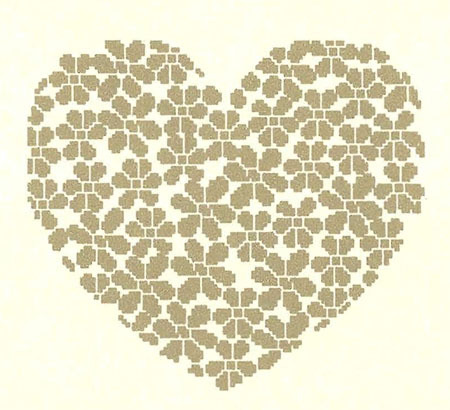 What we like about this design: the heart shape combined with the flowery pattern, ideal not only for a wedding but also for home decoration (eg. it looks great on a square cushion cover and you can pick the exact colour that matches the decoration already in place). Special stitches: None, this is a pure cross-stitch design. This pattern is a monochrome, you can choose your own colour, the designer has recommended Ecru to stitch on a Natural Linen fabric. The design is stitched using two strands of cotton over two threads of fabric (or one block of Aida). Recommended Fabric: the designer recommends to use linen Aida or 32 count linen, colour "Natural Linen", but you can use the fabric of your choice regarding the type (linen / evenweave / Aida),the stitch count and the colour, 40x40 cm (16x16 in).